MDPAG has produced a set of images to complement the Design for Access 2 manual to explain how to use best practice in accessible design. It shows examples of good and bad practice and clearly identifies design features, including those where designers have misunderstood government regulations or guidance, and which still present obstacles for disabled people. The images cover sections within the Design for Access 2 manual, such as the parking, signage, toilets, door furniture etc. If any individual or organisation wishes to use the images for training or information, they are free to use, provided that the source is credited. Selections from the original selection are available in poster format and in booklet format, in standard and large print. For a CD ROM or booklet, or for more information and advice on standards or use of the images, please contact us. 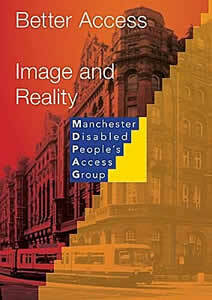 Produced by the Manchester Disabled People’s Access Group 2003 – 2004, funded by the European Year of Disabled People.